Today’s guest post is by Ken O of That F’ing Monkey. I’m going to make a confession and I realize it sounds irrational, but I don’t like Joan Garrick. I know that sounds bad. You hear something like that and think, “How can you hate that nice grandmotherly lady?” Before we even get into the whys I want to clarify, I dislike her, I don’t hate her. I wasn’t cheering when she came down with fake-cancer. Besides the fact that cancer isn’t really cheer worthy, I didn’t want to see her die. Wow. How nasty is that? She could have easily said, “Sorry, but someone already asked me,” or anything like that. Instead she decides to bust on his football skills. And bless his heart; Jay somehow still wants to impress her. He gains super speed and immediately uses it for football. Maybe it’s because I’m not a football fan? I’ve also though of Joan as cold hearted after that. I realize Iris didn’t come off any better. 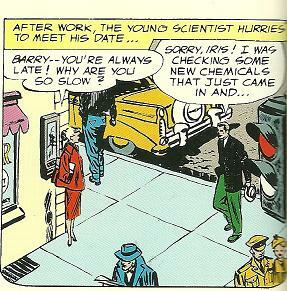 In her first panel she’s chastising Barry for being late. I’ve read a number of other people’s complaints about how nasty Iris was during all those early adventures, but for some reason I never disliked her. Maybe it is because I’ve been stood up before and I know what a soul crushing blow to the ego that can be. How did the other women in the Flashes’ lives fare with their first appearances? Compared to Iris and Joan, Linda’s first panels with Wally are so boring that my scanner didn’t even see fit to digitize all of the dialogue. It was just a television interview without a hint of attraction or flirtation. Not that you can blame Wally, Linda isn’t exactly looking her best here. I was torn with Angela. Do I include the panel of Wally snatching her into his arms because he thinks she is some on looker swiping police evidence or since she falls for Walter do I just include the mildly creepy enjoying CPR panels? I went with the mildly creepy. Then there is Bart and Valerie in the old classic; welcome to my bedroom, who are you again? 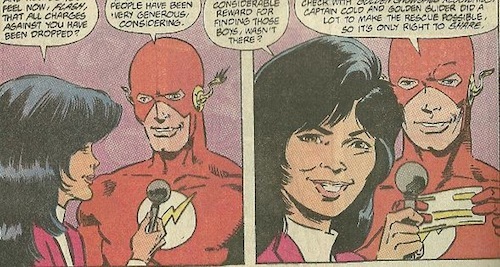 This entry was posted in Flash History, Opinion and tagged Angela Margolin, Barry Allen, Bart Allen, Guest Posts, Iris West, Jay Garrick, Joan Garrick, Linda Park, Valerie Perez, Wally West, Walter West on December 10, 2010 by Guest Blogger. Can’t remember if it was in the original version of the story, but when it was re-told in Secret Origins (#8 I think?) 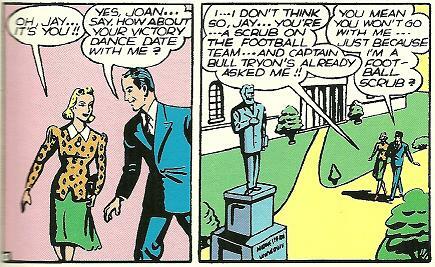 once Joan found out Jay had super-speed she convinced him that he had to use his power…to win football games. Have never really been a big fan of hers. 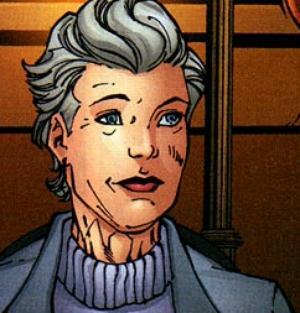 Most of what I know of Iris comes from reading Wally’s series and how much he loved her, so I never had any real problems with her, but reading The Flash now and seeing her as a hot 20-something year old (younger than Wally in appearance now) it feels…strange. Almost dirty. Linda I didn’t like at first, but she really grew on me and she’s my all-time favorite “Flash Wife”. lol well done! Though I’m sure Mr. Tyron had a great life without Joan.